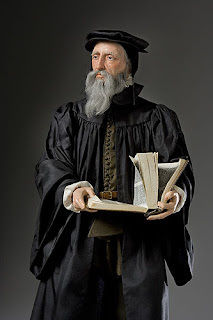 Note: Part fourteen in our series from Calvin's Institutes on government and office. But no sober person will deny that the regular mode of lawful calling is, that bishops should be designated by men, since there are numerous passages of Scripture to this effect. Nor, as has been said, is there anything contrary to this in Paul’s protestation, that he was not sent either of man, or by man, seeing he is not there speaking of the ordinary election of ministers, but claiming for himself what was peculiar to the apostles: although the Lord in thus selecting Paul by special privilege, subjected him in the meantime to the discipline of an ecclesiastical call: for Luke relates, “As they ministered to the Lord, and fasted, the Holy Ghost said, Separate me Barnabas and Saul for the work whereunto I have called them” (Acts 13:2). Why this separation and laying on of hands after the Holy Spirit had attested their election, unless that ecclesiastical discipline might be preserved in appointing ministers by men? God could not give a more illustrious proof of his approbation of this order, than by causing Paul to be set apart by the Church after he had previously declared that he had appointed him to be the Apostle of the Gentiles. The same thing we may see in the election of Matthias. As the apostolic office was of such importance that they did not venture to appoint any one to it of their own judgment, they 2325bring forward two, on one of whom the lot might fall, that thus the election might have a sure testimony from heaven, and, at the same time, the policy of the Church might not be disregarded. Analysis: Though staunchly defending the necessity of divine call, Calvin also aknowledges God's use of human means to set apart bishops. The setting apart of Paul and others by prayer and the laying on of hands in Acts 13 provides the model for this. Thomas Watson on "holy conferences"